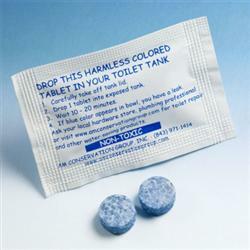 Leak Detection Dye Tablets are used to identify leaks in your toilet tank that can waste thousands of gallons of water annually. 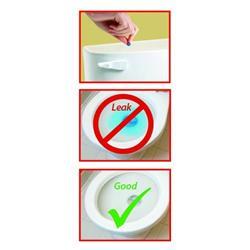 Worn, old and poorly made toilet flappers can leak undetected allowing water to continuously flow down the drain. Leak Detection Dye Tablets, when placed in the toilet tank, dissolve, turning the water blue. If blue water appears in the bowl, you have a leaky flapper that needs to be replaced. The Leak Detection Dye Tablets are packed 2 per bag in a moisture-resistant pouch with bi-lingual instructions. Non-toxic, non-staining and effervescent.